Yesterday, alleged Aurora theater shooter James Holmes declined to take the stand to testify during his trial. 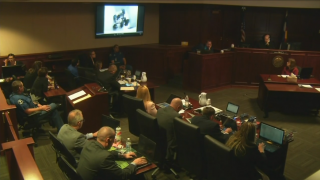 Facing repeated questioning from Judge Carlos Samour in Arapahoe County about his rights were he to testify and undergo cross-examination, Holmes answered in simple yes no responses to the judge’s questions. With Holmes declining to testify and face cross examination during his trial, the defense is expected to complete its case this week and closing arguments for the trial will begin next week.